It’s that time of year when we start thinking about what to get family and friends for the holidays. If your loved one is a traveler, there’s seemingly no limit to great gift giving ideas. 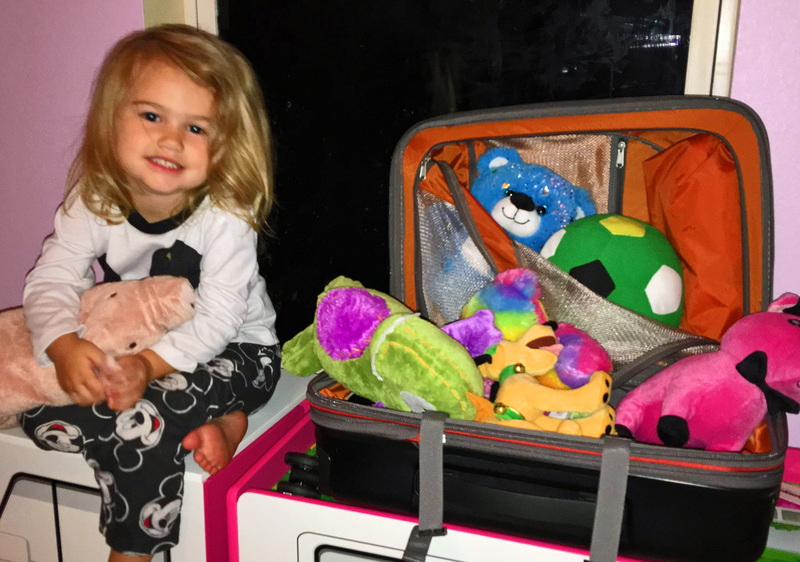 Luggage is a great gift idea even for the little ones on your list. 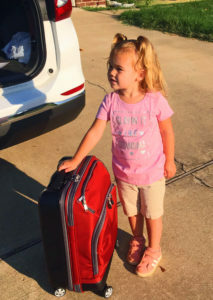 I decided earlier in the year to get my three-year-old granddaughter a suitcase. At first I looked at the usual child’s suitcase, but I kept remembering all those times in the airport when it wasn’t the child pulling the suitcase, but rather the adult bent over pulling it along as well as their own carry-on. It was my daughter who suggested I get a 360 carry-on. She pointed out that Ainsley isn’t always going to be little. A nice piece of luggage would last her for years. Another bonus is Ainsley can push the suitcase instead of pulling in on two wheels. Plus, the handle extends to adult height. 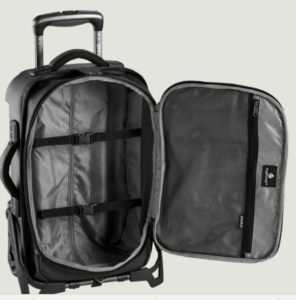 I chose eBags TLS Hybrid Spinner Carry-on. The back is hard-sided made of polycarbonate. The front side is made heavy grade material making the front soft-sided. It’s brilliant since it has the sturdiness of a hard-sided suitcase plus the expandability of a soft-sided suitcase. Ainsley loves it and not only uses it on trips, but uses it every weekend she stays with me. 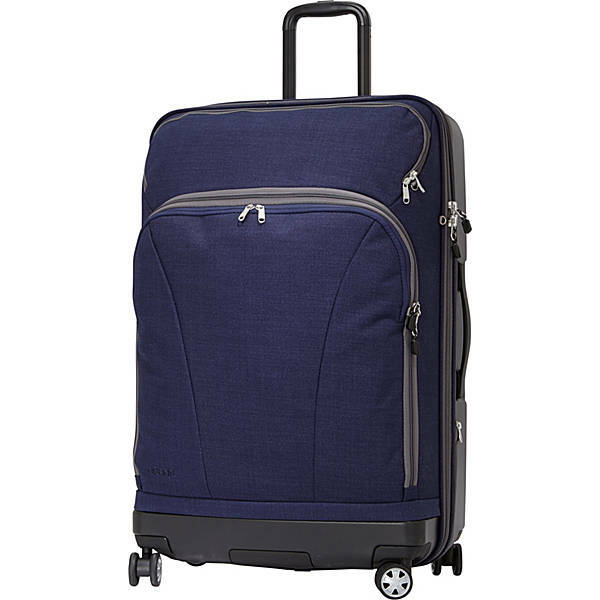 Because of this, when I was looking for a 30 inch suitcase for trips that are more than two weeks long, I chose the TLS 30″ Hybrid Spinner because I knew of its features and quality. 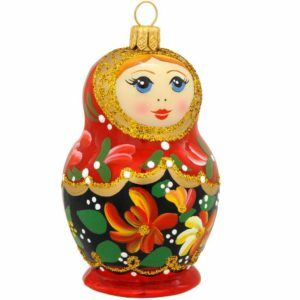 I just packed for Russia and all my needs are arranged neatly in the different compartments with space left for the Matryoshka stacking dolls I plan to buy. Speaking of souvenirs, I came across another fantastic suitcase from Eagle Creek if you are a shopper like I am. The Morphus International Carry-On is nicknamed the world’s largest carry-on! Basically it’s a suitcase inside a suitcase. On the way, use one suitcase and on the way home you have another suitcase for all your purchases! 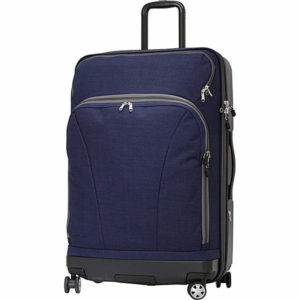 Just separate the inside suitcase from the wheeled luggage to double your carrying capacity for the trip home. Or if you are planning to trek on your vacation and need a sturdy backpack, the inside suitcase features straps to convert it to a backpack. New too is the Eagle Creek National Geographic Guide Series including luggage, a duffle, backpack and Pack-It Storage Compression Cubes. This past year I went on a solo, three week, 4,041 mile road trip. If the person on your list is planning a road trip in 2019, you may want to consider the eBags Crew Cooler II. Originally designed for flight attendants and pilots, this little cooler has all the bells and whistles you need in a compact design. 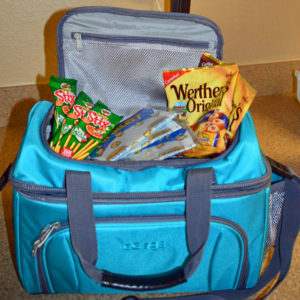 A few features include a top “dry” compartment perfect for non-perishables, a zippered mesh pocket in the lid to keep napkins and other small items in place and, of course, a “cold” compartment that is completely insulated. It holds ten cans of soda. An elasticized mesh pocket against the body is great for packets of mayo, mustard, etc. 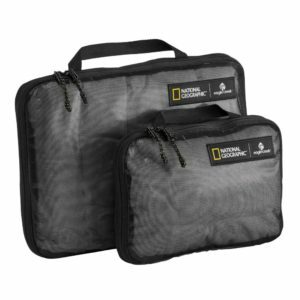 plus there is a zippered mesh pocket against the front – a perfect place for silverware. 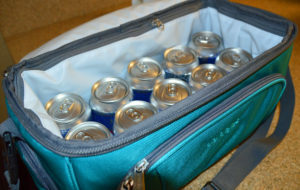 On the sides of the cooler are special pouch pocket water bottle carriers. In addition to handles and a removable shoulder strap, it has rear pass-thru pocket for stacking on top of your suitcase which I loved for taking it into hotels with me. As you may know, I am a huge fan of RFID-blocking and anti-theft accessories. RFID (Radio-Frequency Identification) uses electromagnetic fields to identify and track information attached to objects including credit cards and passports. Although it has been around for years, it’s relatively new use is identity and digital theft. RFID skimming enables information from RFID-based smart cards to be read and duplicated. I found several RFID-blocking bags and wallets this year. 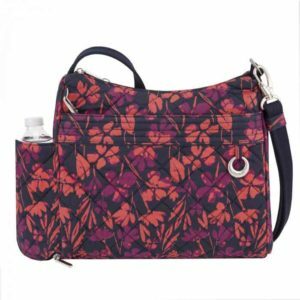 Travelon’s boho crossbody bag comes in several great designs and features an RFID – blocking main compartment and card slots, a zip wallet pocket, locking front zip pocket and rear zip pocket, and a feature I love, a mesh expansion pocket that holds a water bottle, umbrella or sunglasses! There’s also a tethered key clip with LED light. Travelon also offers a matching wallet that can be used as a wristlet. 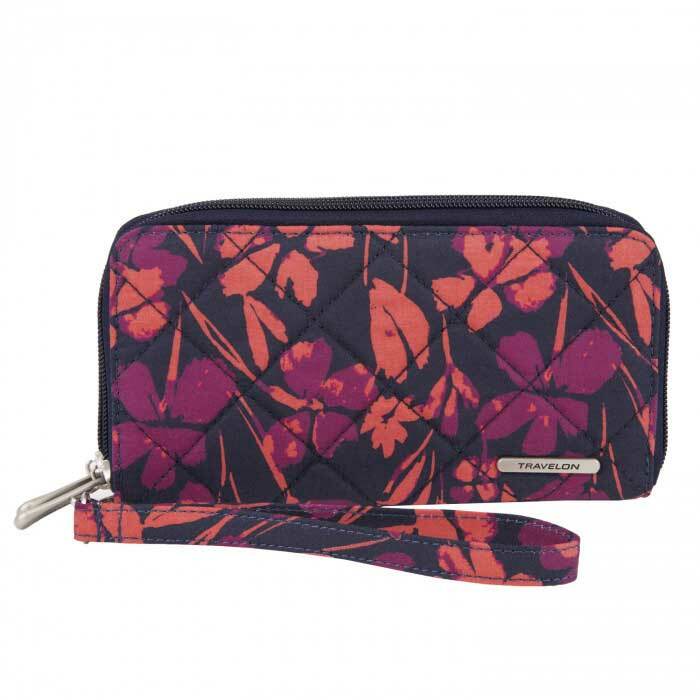 Featuring two zip compartments, card and currency slots and a coin pocket all with RFID – blocking, it is the perfect companion piece to the crossbody bag. 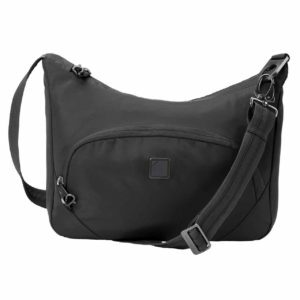 Another great find this year is from Lewis N. Clark; the Secura Premier Anti-Theft Messenger bag. 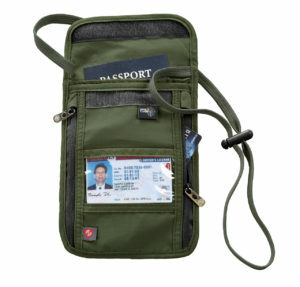 In addition to the RFID-protected card slots, the fabric is slash-resistant and the shoulder strap has an internal stainless steel cable for an additional way to protect your belongings. Locking hardware also allows you to secure your purse to the back of your chair without worrying that it’ll be snatched by someone passing by. On almost every trip I also use a neck stash for times when I don’t want to take along a purse or while taking a backpack and carry-on suitcase on an airplane. 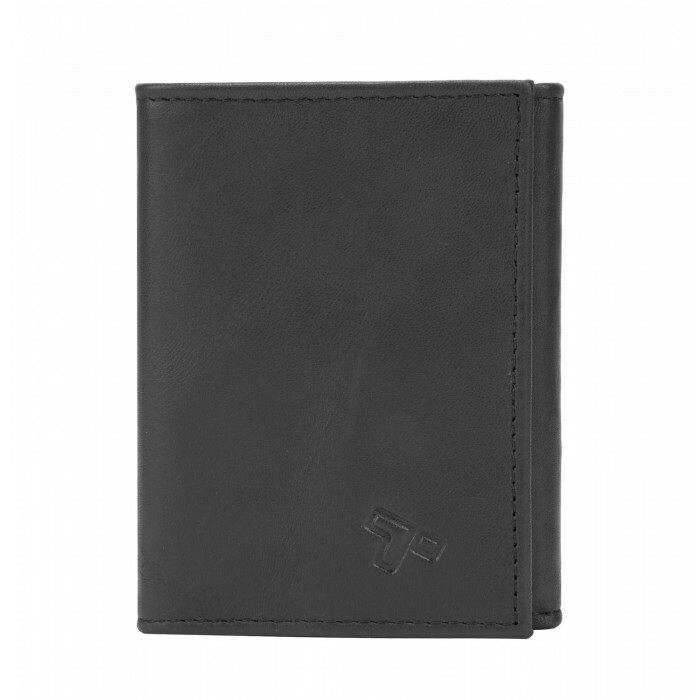 It’s a secure place for my passport, credit cards and cash, and is easy to keep out of sight. I also use it while moving around a cruise ship. For the men in your life there are several RFID-blocking wallets available for every taste. 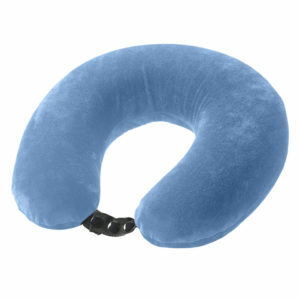 When you are flying in economy for any length of time, you need a neck pillow. I found two this year I really like. The Travelon Deluxe Wrap-N-Rest Travel Pillow completely surrounds your neck giving you 360 degree support. 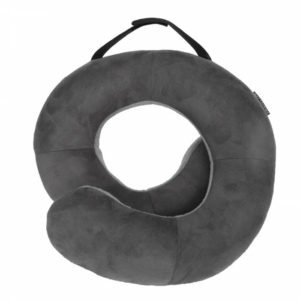 The Lewis N. Clark Memory Foam Neck Pillow reacts to body heat making the memory foam mold to your head and neck keeping your head from bobbing off to the side or drooping down. There’s also a button strap to prevent the pillow from falling off your shoulders. 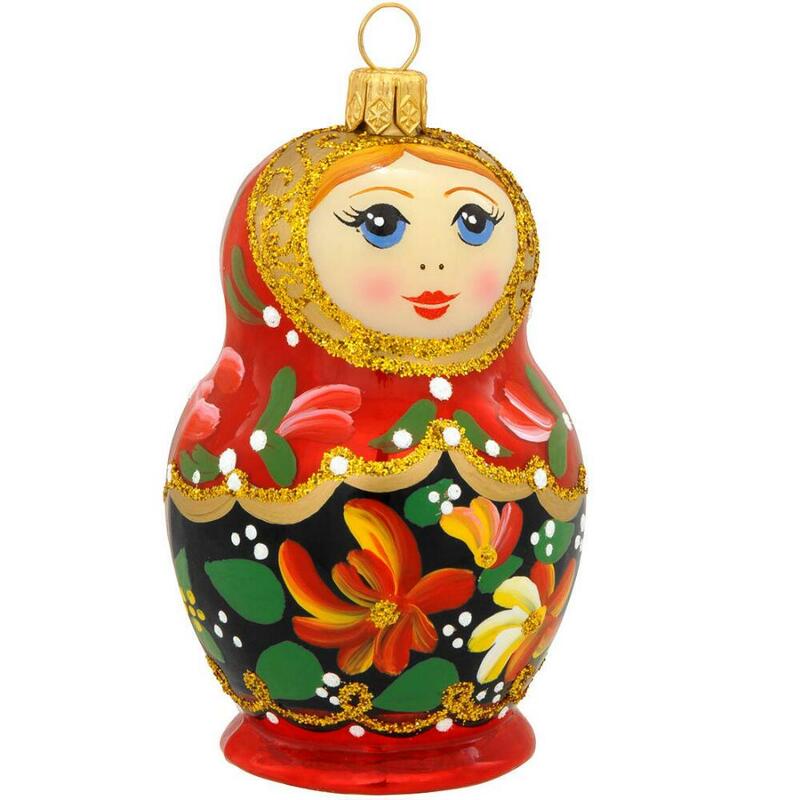 Many travelers collect Christmas ornaments to help them remember the great times they’ve had on vacation; me too! If I can’t find the perfect ornament while on my adventures, I order it from Bronner’s Christmas Wonderland. 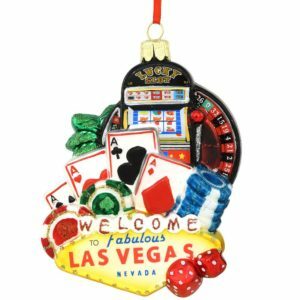 They offer hundreds of beautiful ornaments representing destinations throughout the United States and around the world. 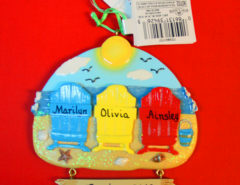 Many can be personalized with dates and names. 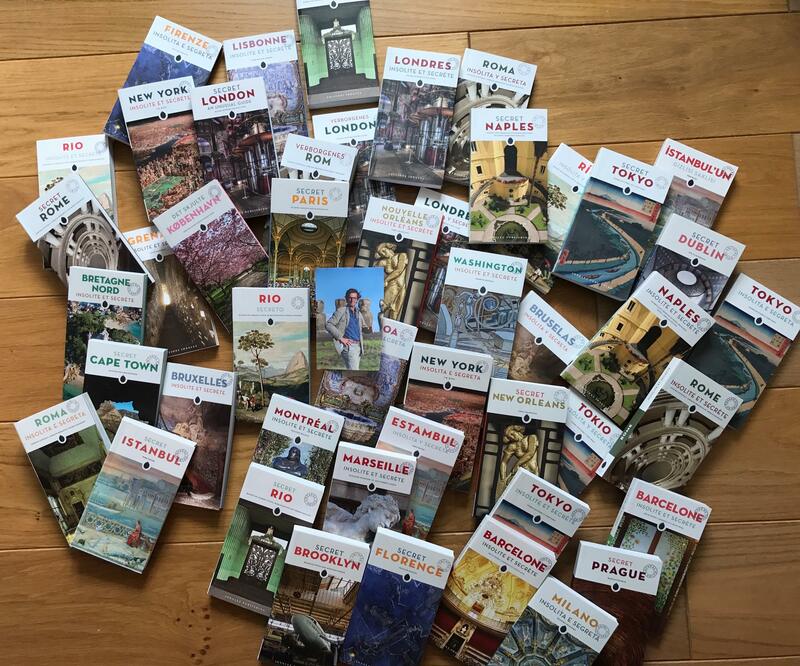 Guidebooks make great gifts too. One publisher of unusual guide books I like is JonGlez. For example; Secret Paris, Secret New Orleans, Private Islands for Rent, Unusual Hotels – Europe and dozens more. If you’ve been there done that, these guidebooks give you a reason to go back to rediscover cities and countries. Three of their latest includes Secret New York, Secret Washington DC and Abandoned Italy, a coffee table book with amazing photos. Picking just the right gift for the traveler on your list is easy; just listen as they describe their needs, their bucket list dreams and their past travels. Here’s to enjoyable shopping and Happy Holidays! Some of the products were provided in exchange for reviews. The honest opinions were that of the author. What’s New for Spring Break and Summer Travel? This is a good list of some great gift ideas for travelers. Thanks for sharing. Thank you! I am always looking for ideas to give my fellow travelers. 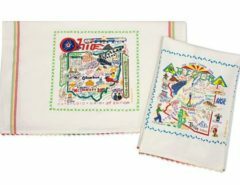 Wonderful gift ideas for travelers…not whimsical ones but those we really need so they are quality ones! Thanks. Some great ideas in this post! I’d personally love the Boho bodycross bag — just perfect in size, colors, and utility. I love the Boho bag too. It’s actually my everyday purse at the moment! I’m in the market for a neck pillow. I’ll check these out. And I like your idea of the child growing into the suitcase, rather than buying pint size. My granddaughter is so proud of her suitcase. Even though its a little big for overnight at my house, its the one she wants to bring! Me too! I always bring back a lot more than I take on a trip…I love to shop!! Some great ideas for travel gifts! We arr so fortunate nowadays to have so many great options to nake our travels easier and more fun. You’re right. It’s a lot more convenient to travel now!! A great list of gifts. The anti-theft bags are a particularly good idea! I love the RFID products. After I learned about them they are all I carry on my travel adventures! A sleep mask is a great idea for a traveler’s holiday gift! !